This month the UNC Board of Governors officially got a new chairman. Harry Smith, part of an aggressive conservative faction of members, took the reins of the board on July 1. 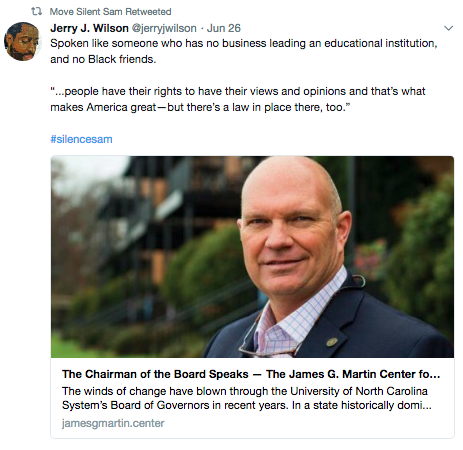 Late last month he gave a victory lap interview to the conservative James G. Martin Center for Academic Renewal (formerly the Pope Center for Higher Education Policy). 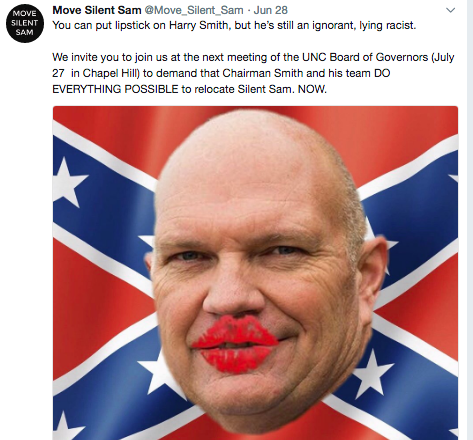 In the wide ranging interview Smith touched on the protests over the “Silent Sam” Confederate statue, the controversial UNC speech policy and future plans for the board and the 17 UNC system schools. There weren’t many probing or challenging questions from the Martin Center, which has pushed and taken credit for conservative shifts in public higher education in the state. But it’s still well worth a read. After the interview was published, the Martin Center took the step of adding a clarification to the story. Follow the law? Hmmmm…imagine that. It’s been in the background for for too long. It’s about time this country gets back into the business and following the laws as written!